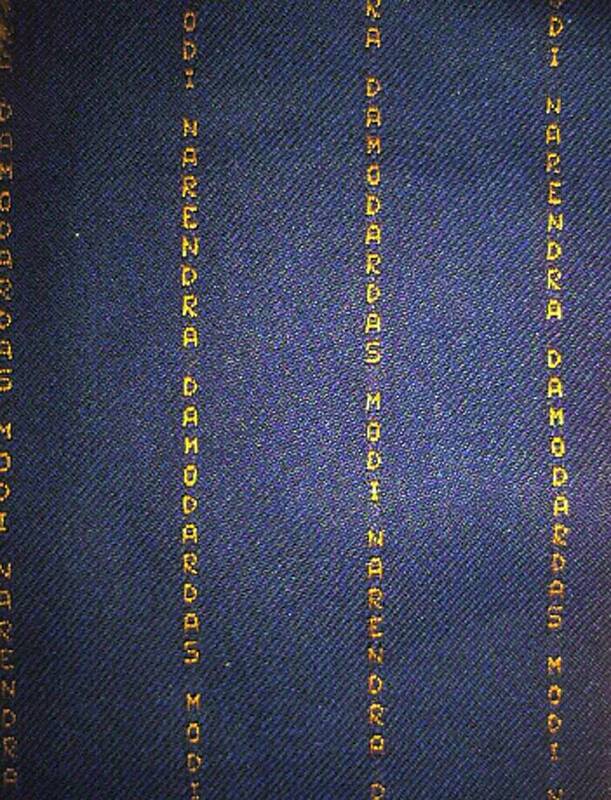 Modi was dressed in a woollen bandhgala with ‘Narendra Damodardas Modi’ monogrammed all over the fabric. There was the shamiana, the tea set, the roses and even the unmissable tea cosy. But there may have been at least one moment at Sunday’s tea party when Barack Obama spotted the fine print — it was all over Narendra Modi. As the Prime Minister and President had tea and talks on Sunday, Modi was dressed in a woollen bandhgala with ‘Narendra Damodardas Modi’ monogrammed all over the fabric as pin-stripes. The owner of Ahmedabad-based men’s clothing store Jade Blue, Bipin Chauhan, who has been styling Modi since 1989, was also the man behind the bandhgala. He refused to give the names of his other clients, or to say whether incorporating the style in this particular bandhgala was his idea or the Prime Minister’s. According to a report in The Daily Mail, then Egyptian president Hosni Mubarak appeared in a suit with his name inscribed into the pin-stripe in 2009, and shortly before he was removed in 2011. Chauhan, who sells ‘Modi kurtas’ — the cotton half-sleeve kurtas the PM is fond of wearing — had a stall for same at the venues of the recent Pravasi Bharatiya Divas and Vibrant Gujarat Summit. Jade Blue also stocks the ‘Modi jacket (the half-sleeved ones he wears)’. Chauhan was given rights to use the Modi label in 2012 by the then Gujarat chief minister himself. At Sunday’s press conference, Obama expressed a desire to buy at least the ‘Modi kurtas’ for himself. If the sight of Modi wearing his own name on his sleeve impressed him as much, he isn’t saying.